Join Wayfind and the Nonprofit Assistance Center (NAC) at our new joint office in South Seattle! 2018 is the last year of GiveBIG as a sponsored giving day by the Seattle Foundation. To go out with a bang, Wayfind and NAC are hosting an open house and breakfast. Please come see our new space, grab some food, and GiveBIG! You are welcome to stop in for as long as you’d like, but we ask that you please try to RSVP to help us with an accurate headcount for food. See you there! 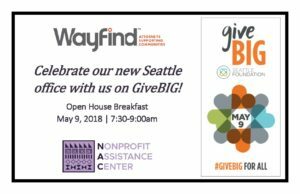 Register for "GiveBIG Open House!"